This entry was posted in 12 x 12 Picture Book Challenge, 31 in 31 Picture Book Reading Challenge, Bullying, Perfect Picture Book Friday and tagged Emma Walton Hamilton, Laura Numeroff, Mo Willems, Norton Juster, Picture book, Wodney Wat by viviankirkfield. Bookmark the permalink. CONGRATULATIONS FOR ON YOUR WINNINGS! lol….. I can just imagine your husband running downstairs as you screamed your delight, congratulations Vivian. As one of the earliest ones to take Emmas course I know you will enjoy, and get a lot out of it.’ Emma is a great teacher and readily available to answer any questions you may have. Enjoy! Your PB choice is very apt for this month, and I also loved your words…. “We each bring special gifts to the table of life…” Loved your review and as always your inspiring activities. Thankyou, I enjoyed your post. I feel very fortunate, Diane! I’m looking forward to reading the materials in each lesson and focusing my energy on learning all that I can…I know that Emma will provide great feedback…everyone has spoken so highly of her. 🙂 Glad you liked my PPBF choice and activities…I love our PPBF group…what an amazing resource for any parent, teacher or librarian! Good pick! I like the bag puppet activity! Congratulations, Vivian…enjoy your class! How fun! I want to see the illustrations as I love capybaras – even bullies! Hi Joanna…Thank you…I am sure I will…I wonder how many of the PPBF and 12×12 participants have alreay taken the course? What a cute craft, Vivian. You always find the best activities. I haven’t read Wodney Wat yet, but it sounds adorable. Did you like Cloudette? I liked that one a lot, and Neville, too. I will check out Kathy’s challenge — especially since it is highly likely I’ll read far more than 31 picture books this month! That’s exactly what I said to Kathy Ellen…what a joy it is to be reading picture books every morning before I go to work! I liked ‘Cloudette’ very much…great message of the little cloud finding important and meaningful ways to be ‘useful and of value’. And Neville had that great ‘surprise’ ending…although I’m sure most adults and many children would have guessed that the mc was Neville. 🙂 My husband was disturbed, however, because he felt that these days, no mother would tell her young child to go for a walk and be home before dark…especially in a neighborhood that was unfamiliar and they didn’t know any of the neighbors yet…and I kind of had to agree with him. 🙂 Hope you join in…I’m sure Kathy Ellen would love it! I think I would wuv Wodney Wodent! I must see if he is in our library. I can read him for one of my 31 in 31! I’m loving Kathy Ellen’s challenge. Great activities — I especially love the hand puppet. Oh my, Beth…that is so funny…you and me both. 🙂 We will rock out in spirit…and dance a little more conservatively in actuality. 🙂 It’s an amazing opportunity for me and I am very grateful to Julie and to Emma! Glad you liked the craft…simple is best, I think…what a lot of fun parents can have with their kids…and all they need is a paper bag and some imagination…that’s why I wrote Show Me How! Congratulations on your free course! I hope your husband recovered from your excitement. I get to read 4 to 5 children’s books every day, so I can’t complain. I really enjoyed the story of Cloudette and how you can always find what you’re good at if you keep looking. And you can’t read Knufflebunny Too without read the first and last one (which made me cry…). My husband has recovered. 🙂 And just picked up 2 dozen new picture books at the library that I had on hold…and one of the is the original Knuffle Bunny…is there a third? Thanks for the good wishes, Milka…I’m going to have a ball with the course! It’s Knufflebunny Free. It’s brilliant. Wow, congratulations on winning a free course. You had me at capybara! I love those giant rodents. I wrote an article about them once, and find them fascinating. Love this recommendation. 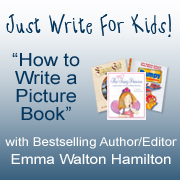 And I’m so excited you get to take a class with Emma Walton Hamilton! I’m having a lot of fun, reading these newer books (although Hooway for Wodney Wat isn’t THAT new). Isn’t funny that most people would run from any rodent they saw in person…but we love to read and write picture books about them. 🙂 And I am totally over the moon excited about Emma’s course…how fortunate I am!!! Congrats on winning the class! And thank you so much for the kind words about the challenge…I’m having a lot of fun, meeting a lot of awesome people 😉 and hearing about SO MANY more books than I would have otherwise. You’ll have to let us know how the class goes! Lynn Munsinger is a favorite illustrator around here, we just love her art. Love all the good news! So happy for you that you won Emma’s course – just awesome 🙂 I can’t believe I haven’t read Wodney yet! I’m a big Helen Lester fan – we love Tacky at our house 🙂 I will have to rectify this oversight! Thanks for adding this too our list! I’m glad I added it also! 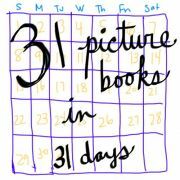 I’m loving Kathy Ellen’s 31 in 31 Challenge to read picture books every day in October because it is ‘forcing’ me to read a picture book every morning and I’ve decided to read the newer books as opposed to the older classics I usually review for PPBF. Glad you liked it, Jake! Oh my goodness! I have got to read this book. My niece told me about it last year and I had forgotten to add it to my library list…now it’s on there. And…congratulations on winning! The class should be awesome! What a unique bullying story — love it that even though Wodney has trouble saying “r”, he has his own strengths and stands up to the bully. Love your choice. Congratulations on winning the JWFK course with Emma! I took the course over two years ago. She is an excellent teacher and you will learn so much. Keep us posted. I learned so much from the course and go back to it again and again. I’ve heard so many amazing things about Emma’s course…it a wonderful opportunity for me and I feel really fortunate! Enjoy the course! That’s exciting, Vivian . . . much better than the alternative scenario your husband was imagining as he raced down the stairs to rescue you! I love the crafts and book as always. Congrats on winning the course. Enjoy! Congrats on your win! Enjoy the course and spread the knowledge… I’m proud of your accomplishments. Even though I’ve been caught up in my offline demands, I still think of early day buddies like you… I might disappear for a minute but not forever… Take care! Eliz…you were my first ‘blogging buddy’…and your blog is still one of my favorites! You are a special lady…I totally understand how life tugs at your attention…it’s doing the same to mine. 🙂 I so appreciate you taking the time to visit and comment on so many of my blogs.